Birdhouses are a wonderful way to attract a variety of species of feathered creatures to your window. Whether colorful or whimsical, these outdoor houses are always welcomed by birds and will give you many hours of fun and fascination as you watch them landing and congregating. Birdhouses are innately nature-friendly, but when you take time to craft one out of an empty plastic bottle, you're adding an environmental benefit by upcycling. 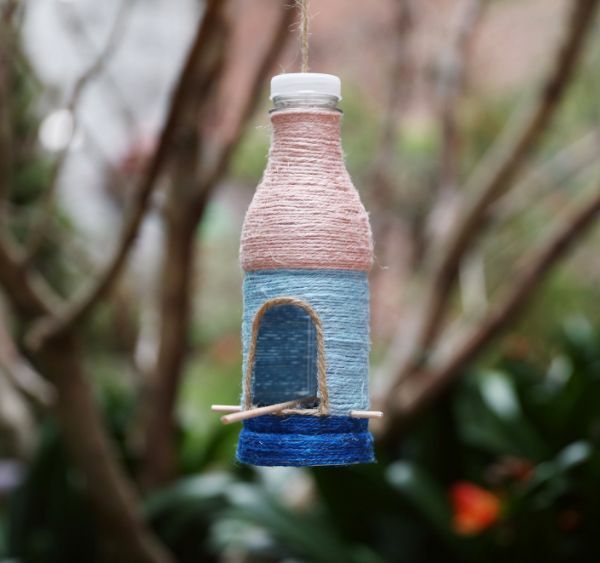 Some colorful yarn and well-placed dowels quickly transform a simple plastic bottle into a charming birdhouse perfect for hanging from any branch. With options to mix and match colors, contents and design, you can customize your creation. Durable and quaint, this birdhouse project is suitable for kids and adults alike. -Plastic bottle with lid, 20 fl. oz. 1. Remove the lid from a 20 oz. plastic bottle, and lay the bottle down on a flat surface with the opening toward the top of the working surface. 2. Use a metallic-colored pen to draw an arch doorway in the center of the bottle. The top of the arch should reach the top quarter of the bottle, and the horizontal line indicating the bottom of the arch should end at the lower quarter of the bottle. 3. Cut the arch out following the lines with an X-Acto knife. This will be the birdhouse door. 4. Turn the bottle horizontally and place a small spot of hot glue at the very base of the bottle, lining up with the horizontal line of the arch doorway. 5. Press the end of a string of dark blue yarn to the hot glue and hold to secure. Continue wrapping the yarn around the bottom of the bottle. Use glue at varying points to make sure the yarn is securely attached. 6. Continue wrapping and gluing the yarn until the entire bottom quarter of the bottle is covered and the bottom of the arch door has been reached. Cut away excess yarn when completed. 7. Lay the bottle down so the arch door is facing up. Mark a point at the right side of the bottle with a metallic-colored pen just above the yarn line directly in the center of the bottle. 8. Cut a small opening at the mark with an X-Acto knife, and push one end of a 6-inch wooden dowel through the opening until it reaches the opposite side. 9. Turn the bottle around, and cut a small opening at the point where the dowel touches the opposite side of the bottle so the end can be pushed through easily. Allow for an even amount of dowel to stick out of either side of the bottle horizontally as perches for birds. 10. Turn the bottle over so the arch doorway is facing down toward the table. Cut a small opening directly in the center of the back just above the yarn with an X-Acto knife. Push a second wooden dowel through the opening, allowing the opposite end to travel out the front of the door as a third perch. Use a small spot of hot glue to attach the second dowel to the horizontal dowel at the intersecting point within the bottle. 11. Cut 1 inch of brown twine with scissors, and use hot glue to attach it to the bottle directly underneath the dowel that emerges through the arch door. 12. Cut half an inch of light blue yarn, and attach it to the bottle to the right of the brown twine to fill in the plastic space between the two dowels. Repeat for the remaining space between the last two dowel perches. Cut away excess yarn as needed. 13. 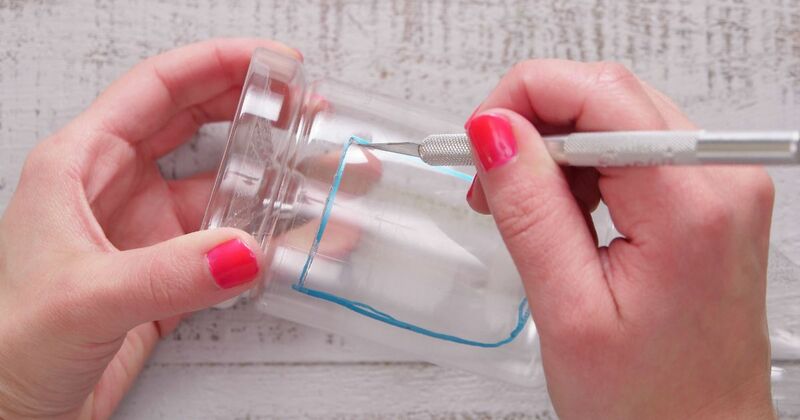 Continue cutting pieces of light blue yarn and attaching with hot glue until the entire center portion of the plastic bottle has been covered, leaving the arch doorway clear of yarn. Stop when approximately one quarter of the plastic bottle neck remains exposed. 14. Use hot glue to line the arch doorway, and attach brown twine along the edge. Cut away excess twine once the arch doorway has been lined. 15. Place a spot of hot glue just above the line of the light blue yarn, and attach an end of light pink yarn. Wrap the pink yarn around the bottle and attach at various points with hot glue until the entire neck of the bottle is covered, stopping at the lid groves. Cut away excess yarn when this point is reached. 16. Punch a hole directly in the center of the bottle lid with a leather hole punch. 17. Cut 12 inches of twine, and pull one end through the lid, tying a secure knot at the interior and cutting away excess twine as needed. 18. Loop a second knot at the opposite end of the twine and pull to tighten. Twist the cap in place on the plastic bottle. 19. Hang the birdhouse on an outside branch from the twine knot, and enjoy bird watching from indoors.